RALEIGH — Move over, piano teachers. Take the bench, soccer coaches. Computer coding is on the rise as an after-school activity for Raleigh’s K-12 students. In recent years, coding has become associated with the infamous “skills gap,” and for good reason. More than 1 million tech jobs will go unfilled by 2020, shows data from the U.S. Bureau of Labor Statistics. Additionally, the National Center for Education Statistics reports fewer than 3 percent of college graduates in the U.S. leave school with a degree in computer science. One solution may be for-profit coding boot camps, which became popular in 2012. These programs promise adults entry into programming careers, and cost an average of $12,000 for 12 weeks. A handful of boot camps have closed, leaving skeptics to wonder if the market can sustain them. But some programs are successful, and industry growth requires failure, a handful of experts say. While coding boot camps redirect adults into programming careers, K-12 schools face their own challenges with science, technology, engineering, and math classes. Tech education is lacking in North Carolina’s public schools, and the state must recruit more STEM teachers, lawmakers say. Legislators have a few solutions in the works, including a program designed to draw STEM experts to rural schools. But while parents wait for the system to catch up, private coding lessons are another option. Coding isn’t just for aspiring software developers. The tech language is a practical skill as necessary as public speaking or math, say three entrepreneurs behind one of Raleigh’s newest coding schools for kids. TheCoderSchool is much like a Taekwondo or ballet studio, minus the sparring and dancing, said owner Mehul Shah. Kids who attend develop discipline, grow good communication skills, and, most important, learn about critical thinking and problem solving. 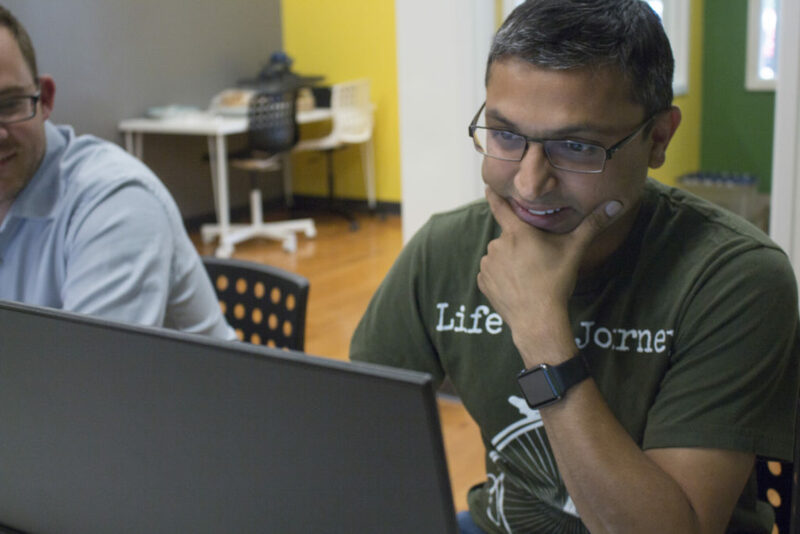 Shah, who opened his first CoderSchool franchise in Cary last year, hatched the idea while teaching his own children to code. Shah discovered theCoderSchool, a franchise based in Silicon Valley. TheCoderSchool was founded in 2014 by Wayne Teng and Hansel Lynn, two entrepreneurs who built their first school in Palo Alto, California. Last year, the company opened its first franchise in California. The enterprise has since grown to 16 schools spread across Georgia, Massachusetts, New York, Texas, Washington, and North Carolina. Shah officially opened in Raleigh on Sept. 9 and will add several more schools around the Triangle over the next few years. That expansion makes North Carolina the franchise’s fastest growing hub outside California. The idea for theCoderSchool sprouted after Lynn, who worked in software and founded a handful of other businesses, tried to teach his daughter the basics of code. That’s when Lynn reached out to his best friend, Teng. In an era where bootcamps promise adults careers in coding, Lynn and Teng’s franchise takes a different approach. Kids who come to theCoderSchool aren’t expected to grow up and become web developers or software designers, Teng said. If anything, a basic knowledge of coding is simply a necessary part of life. Small business owners, lawyers, artists, athletes, and even doctors can benefit from knowing how to code, Shah said. Social media, computing, and analytics are now integrated into most jobs. “One of the things that I do is design hardwardare. But I still have to learn how to code,” he said. TheCoderSchool’s curriculum is flexible, tailored to a student’s personal learning style, Shah said. When first enrolled, kids between the ages of 7 and 18 learn the basics. It’s about building a foundation, Teng said. As soon as a student understands the framework, he or she chooses a project to work on. Some kids build websites. Others dive into video game design. Tutors design lessons so that students can advance at their own pace. Mehul recommends students spend one to two hours a week at theCoderSchool working with an instructor. Kids should practice their skills at home, just like they would if taking music or art. Lessons at theCoderSchool are priced depending on the market and run between $40 and $50 an hour at Shah’s Raleigh and Cary locations. Students can take classes for two years, or for 10. There’s always something new to learn, Lynn said. “We are still trying to convince the parents that it’s not all art and music and sports for after school. There’s also coding,” said Lynn. The Raleigh area offers a handful of private, kid-oriented coding programs, including Tech Talent South, Sylvan Learning of Raleigh, and summer camps at N.C. State University. The market has plenty of room for more schools, Lynn said, as coding is fast becoming a standard requirement on any résumé. In a world worried about the “skills gap,” theCoderSchool is more concerned with challenging kids to become thinkers and problem solvers, Teng said. Coding is about breaking a problem into parts, and tackling it step by step, a skill that stretches across any field, Lynn said.